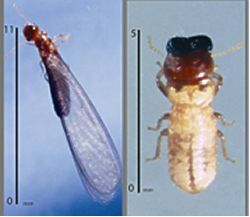 The West Indian drywood termite is covered by Prevention and Control Program for West Indian Drywood Termite and is restricted matter under the under the Biosecurity Act 2014. If you find evidence of West Indian drywood termite activity, you must report it with 24 hours, contact the department's Customer Service Centre on 13 25 23. The purpose of the Prevention and Control Program for West Indian Drywood Termite (the Program) is to manage and reduce the pest in areas where it is detected and prevent its spread in Queensland. Find out more about the West Indian Drywood Termite Prevention and Control Program. The West Indian drywood termite is an introduced species in Australia and considered the world´s most destructive drywood termite. It has caused considerable economic damage to timber-in-service in Brisbane, Maryborough, Bundaberg, Rockhampton and Townsville. Drywood termites generally cause moderate damage to timber structures in coastal areas and adjacent tablelands in Queensland. Each of the four introduced species has a restricted distribution within this zone, but the native species (Cryptotermes primus) is more widespread. Other native species are of little economic importance. Knowing the habits of drywood termites and regular house inspections are the best insurance against these pests. The West Indian drywood termite is restricted matter and the department must be notified of its possible presence. Currently, treatment bears no cost to the householder. Accurate species identification is recommended before treatment is implemented. Find out more about drywood termites in Queensland. Drywood termite infestations are recognised by piles of frass (faecal pellets) associated with timber that may conceal extensive termite galleries. 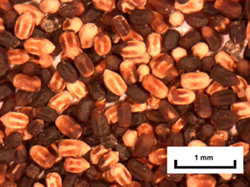 West Indian drywood termite frass from hoop pine is characteristically reddish brown, gradually turning black with age. Typically, its frass is larger and more pointed than that produced by the native drywood termite, C. primus. Drywood termite frass is distinguishable from ant debris, which contains fibres or parts of dead insects. Careful examination of timber close to the frass pile will reveal a small hole (1 mm diameter) but this may be sealed and difficult to see. Infestations may be discovered accidentally by breaking into a gallery in floorboards or windowsills. Rarely, collections of termite wings are found around windows or in the corners of rooms. Cryptotermes dudleyi (introduced): established on Thursday Island. It is most commonly found in pine, especially hoop pine and cabinet woods such as maples (Flindersia species), red cedar (Toona australis) and silky oak (Grevillea robusta). If you find evidence of West Indian drywood termite activity, collect a sample of the frass or termite wings and, if possible, several soldiers. Contact our Customer Service Centre for advice.